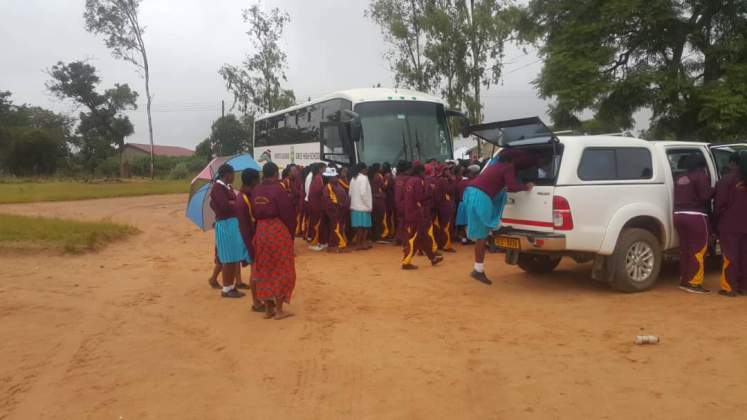 Even calls to be wary of the ravaging Cyclone Idai, whose effects have since been felt in Mashonaland East, could not deter the 145 girls at Zimbabwe's top school, Monte Cassino High, from executing their mission. On Friday, Macheke Police Station was their assembly point as police officers woke up to witness a group of young girls scattered all over the premises. As early as 4am, the girls manoeuvred their way out of the school, evading the highly-rated security system at the Catholic institution. Their destination was 7km away and for some it was the first time to walk such a distance. But with the determination of athletes, the girls pulled through, and in three hours they had arrived at Macheke Police Station to air their grievances. However, fate and misfortune was on their side, as the young girls passed through a bridge that is usually flooded at this time of the year. The bridge is under construction. They comprised mainly of Form 4 and 6 students while a lesser number were Form Ones and Threes. The girls revealed that their unusual protest was triggered by corporal punishment meted on them by teachers and the confiscation of their laptops as punishment. The girls also complained of sexual harassment and a litany of other allegations. Mashonaland East acting provincial education director Kennedy Maturure said preliminary investigations had indicated that the school does not have properly laid-out grievance-handling mechanisms as the incident could have been avoided. The girls wanted to open a case against the teaching staff. However, it took officials from the Primary and Secondary Education ministry to convince the girls to return to the school. It was easy, and they were happy that at least they got attention. In response, the school authorities brought buses and trucks to ferry the girls back to school. Zimbabwe National Council for the Welfare of Children programmes manager Maxim Murungweni said schools should do away with corporal punishment and use other disciplinary methods. "It is a cause for concern that schools continue to administer corporal punishment on children instead of using other forms of disciplining them," he said. "As child rights organisations, we have been advocating for the total abolishment of corporal punishment in all settings - that is school, judiciary and at home - as stipulated in the African Charter on the Rights and Welfare of the Child, the United Nations Convention on the Rights of the Child and also in our country's constitution. "We are happy that government is in the process of putting laws that will clearly outlaw the use of corporal punishment. "However, we need to fully explore and provide adequate information on the other alternative methods of disciplining children." Monte Cassino High School is a girls' learning institution located in Macheke and is popular for its regular 100% pass rates for both O' and A' levels.